Has "Taare Zameen Par" Delivered? Which movie are you looking forward to more, Tare Zameen Par or Welcome? Ok first things first. I have to admit to being a fan of Aamir Khan. You hear rumours that he’s not so likeable off screen, is very private and anti media etc but let there be no doubt, the guy is a top draw actor and has been for many years! For me, what makes him stand out compared to other big names such as SRK is that he is very selective in what movie he appears in. This means that he makes fewer movies, however those he does star in turn out to be award winning on many fronts including the music as well, I mean the guy is a perfectionist! Take any of his flicks since 2000 including Lagaan (ARR), Dil Chahta Hai (SEL), my personal favorite Rang De Basanti (ARR) and Fanaa (Jatin Lalit)…they all received some form of acclaim, generally on numerous levels including his acting but also for the music. So when this hugely talented actor launches his own movie house ‘Aamir Khan productions’ and at the same time marks his directorial debut with Taare Zameen Par (TZP), as an audience you can do nothing but take note. What’s the fascinating theme that has inspired him to mark his debut (producer/directorial) and more importantly for music lovers, who does he back for the soundtrack? In short….’Kids’ and the talented trio ‘Shankar Ehsaan Loy’ (SEL)! Without going into too much detail, the movie concerns the subject of childhood (in fact it’s been billed as a ‘sensitive portrayal of childhood’) based on one man’s experience of working with children for 7 years. That man is Amole Gupte (an actor and close friend of Aamir Khan for 25 years) who is the brains behind the movie (writer/creative director) and the man in charge of pre-production including the soundtrack which he worked on closely with SEL. So does it live up to expectations and contribute to the common goal of the movie which is to enhance our ‘sensitivity towards children’? And more interestingly, for the now grown ups including me and you, does it rekindle our very own childhood in the process? The sound of twinkling stars gives rise to your journey of (re)discovering what childhood actually means i.e. how children behave, why they behave in such a manner and the impact that has on everyone around them. 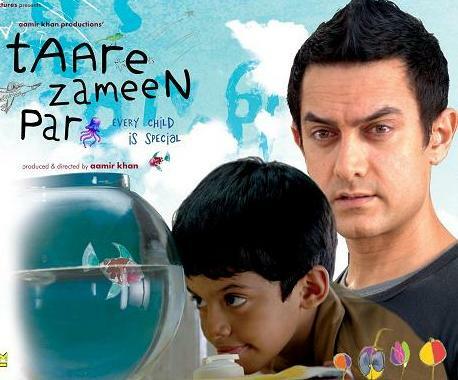 Thus commences the quite brilliant title track Taare Zameen Par. What starts off as a slow light hearted poem supported by a soft piano arrangement in the background, eventually transcends into a heavenly sketch of the minds of children and those around them i.e. the recipients of their behaviour. SEL use a wide array of (synth) instruments in a bid to deliver a soothing number but it’s Ehsaan’s guitar and the intermittent use of the sitar / tabla that achieves this so successfully. I have not heard Shankar Mahadevan sing as well as this for years such is the impact of his supremely somber vocals (backed by superb background vocals of Dominique and Vivinenne). The singing is indeed a highlight of this track and coupled with Prasoon Joshi’s amazing heart-felt lyrics this track excels completely off the richter scale! Verdict: This is a divine listening experience that makes you sit up, enjoy and contemplate the meaning, behaviour and impact of children. To call it special is an understatement. The next track Kholo Kholo continues the portrayal of childhood albeit in a far more upbeat context than the previous song. This is a teacher’s perspective of what a child means to them, it’s objective and potential in life and how it should go about fulfilling this (as suggested in the above lyrics). It is one thing outlining such a perspective but to give SEL full credit, the manner of their delivery is nothing short of fabulous! On a musical front, the key instigator for providing the mood and atmosphere is Ehsaan Noorani who further showcases his wonderful guitar skills (as in Johnny Gaddaar) that provide an irresistible backdrop for each stanza. When the chorus kicks in, the crescendo of drums intertwined with multiple guitar strings leaves a beautifully uplifting and contrasting effect before the next stanza begins. With any ordinary guitarist this would have sounded monotonous but not with Ehsaan at the helm! Incidentally, listen out for a distinct verse in the middle where the trio seamlessly switch to traditional music, the effect being neat. Raman Mahadevan’s vocals match the vibe pace for pace displaying stunning versatility in the process. Add to that Prasoon’s simple but thought provoking lyrics and you have back to back winners. Verdict: Providing another superb insight into the mind of a child, Kholo Kholo is guitar strung heaven that demands repeated listening, simply wonderful! But hold on, this is all serious stuff right? Do children not have khel aur masti? Well of course they do listeners and that’s exactly the point of the next track Bum Bum Bhole. In fact it’s Aamir Khan (dressed as a clown ready to address his entertainment hungry audience!) himself who introduces this song in perfect fashion with a short but snappy comic liner ‘gili gili mal sulu sulu mal…’ that makes about as much sense to us as it does to the kids...cue their inevitable laughter and hysteria! What follows is an extremely lively tune full of peppy synth beats and hand clapping with multi layered vocals and interaction between the children and the teacher / entertainer (Aamir Khan) and an overlaying third person view that describes this enlightening relationship. This third person view (occasionally fun occasionally philosophical) is provided by the gifted singer Shaan who, as he has done so on many occasions this year, lifts this song to new heights with his breezy vocals! Prasoon’s magical and versatile lyrics impress yet again. Verdict: A colourful, fun packed, yet completely meaningful tune that gives you further insight into what makes a child tick…this one will appeal to the young and old! The fun / masti theme of the soundtrack continues to its pinnacle with the short but quite amazing Jame Raho! This one picks up where Bum Bum Bole ended but turns the cheerful music on its head and replaces it with an awesome rock tune that is inspired by Ehsaan’s acoustic guitar, leaving behind a mischievous atmosphere…but don’t worry, the kids are all behaving (generally! ), it’s just another sketch of what they’re up to but wrapped in a different flavour! Vishaal Dandlani’s intense yet humorous vocals and Prasoon’s short and snappy verses (full of parody) make for an extremely satisfying listen! In fact this track could easily have been something out of a Johnny Gaddaar, such is its unique and ‘hatke’ nature. Verdict: Hats off to SEL and co for this gem which adds further variety to the soundtrack! Right enough of the khel aur masti as the soundtrack gets back to its elements with a beautiful portrayal of a child’s view of his eternal companion, his own godsend…Maa, arguably the most cherished track here. Words cannot express the impact this song had on me. It’s an emotional roller coaster that has the potential of bringing tears to your eyes one minute and then a smile the next...with flashbacks of your own childhood somewhere in between…SEL have showcased the art of melancholy music many a time but I doubt I have heard one this good; delivered by a heavenly percussion to begin with and then eventually dominated by some stylishly subdued guitar strings. Shankar Mahadevan delivers vocals as rich and as solemn as you will hear for a long time. Prasoon’s poetry is so simple yet out of this world; honestly I can do nothing but applaud his efforts here with the way each verse connects with you, it’s ethereal. Verdict: Grab a few tissues and listen to this track in earnest, then appreciate the role maa plays in a kids life (from a kids view). I defy anyone not to be touched by this sublime effort. Let’s face it children can be a handful and have this canny knack of driving us older folk insane at times! Well in the penultimate track, Bheja Kum, we have a very short but confrontational meeting between teachers and pupils pouring out their feelings to one another (in short the teachers losing their heads, the kids having a good laugh!). The music is loud and abrupt and provides the right atmosphere. There are plenty of vocalists involved here including Mahadevan, Loy, Aamir Khan, and a few junior singers and all in all it’s an interesting little tussle to see who wins the mind games (I’ll let your mind wonder as to who wins!). And so we come to the final stage of our journey into the discovery of childhood…what a journey it has been but does it end in a marked fashion? Well the first thing that strikes you is that it’s not composed by SEL at all, in fact it’s a guest composition by Shailendra Barve. But worry not listeners as we are treated to a perfect stand off with the aptly titled Mera Jahan, a track that may leave you quite literally, in a daze of stars! Right from the opening when junior singer Auriel Cordo (later joined by Ananya Wadkar) recites Amole Gupte’s stirring lyrics you sense this one is coming right from a child’s heart...it’s about their world and they have a message to share. The composer allows the multi faceted singing to dictate the track and keeps the music light and hidden away in the background until the arrival of the chorus. Adnan Sami’s rendition is nothing short of exquisite (backing vocals by Suraj and Shailendra Barve). The track is elevated further by a young choir (Gleehive). Verdict: This is a fitting end to what can only be described as a complete article…TZP. To top it all off we have a lovely piano piece in the instrumental Ishaans Theme. TZP soundtrack unquestionably lives up to all expectations and how! It has the potential to appeal to a wider audience considering the maturity and variety of each track on offer here. But that’s the whole point of this album; it aims to send a message to everyone that is NOT a child so that they can further appreciate a child in a child’s world. Parents with young children (or other relations who have regular contact with them) will appreciate this soundtrack immensely...yes children can be a handful but they also act as a living and breathing beacon in our lives as well. Others will love it simply because it has a strong potential to rekindle our own childhood and remind us of what life was like growing up as a kid, at home / school / outdoors, with your parents, siblings and other close relations such as teachers etc and the way you saw the world it was meant to be seen…innocent eyes, simple heart and a dreamy mind full of curiosity and wonder…TZP relives all that and more. On screen its impact will be elevated even further (incidentally this soundtrack also heightens expectations for the movie). As for credits, well SEL have capped an amazing turnaround in this second half of 2007 (Johnny Gaddaar was a good omen!) and produced in my humble opinion, their finest soundtrack since at least 2004 (Phir Milenge) which is interesting because that also happens to be the last time their soundtrack was so dominated by one instrument; the guitar. One can easily argue a case for TZP being the best soundtrack of 2007 as well. What makes this one so special is its all round polished nature, it oozes quality throughout which you feel has been achieved through a lot of effort involving musicians, researchers, teachers, parents, kids etc and the results speak for themselves; its heart felt impact, variety, its deep rooted meaning, and above all its theme which is unique yet close to all our hearts...sometimes buried but easily unearthed and touched- so it will stay with us forever… just like the soundtrack which is destined to become a classic. So what stops it from being perfect? Well as much as I adore the instrument I feel a little over reliance is placed on the guitar here even with its variety. Also there is too much synth music compared to real instruments and although it sounds fresh, it does not necessarily break any genres.